Finished in Rosso Corsa with Crema hide and burgundy carpets and sitting on the correct Cromodora wheels and Michelin tyres. Air-conditioning in full working order. 1 owner since 1995. Was part of a private collection. Has covered very few miles during this time but has benefited from regular service works including a recent new clutch, clutch master and slave cylinder, new cambelts, reconditioned radiator and steering rack. The car is said to drive without fault with perfect oil pressure, oil and water temperature. Only 75,000 miles. Comes with good history including many old MOT certificates. 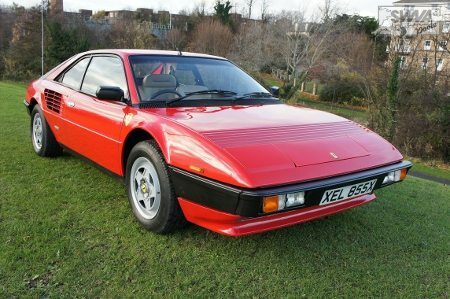 Can’t be much longer that Ferraris like these are available for such small money. A real head turner. “The Mondial was introduced as the Mondial 8 at the 1980 Geneva Auto Salon. It was the first Ferrari to depart from the company’s familiar 3-digit naming scheme and was fairly mild, relative to other Ferraris, in terms of performance, drawing criticism from the motoring press. It used a mid/rear-mounted Bosch K-Jetronic fuel injection V8, shared with the 308 GTBi/GTSi, mounted transversely. The engine was originally used in the 1973 Dino 308 GT4. The K-Jetronic system is mechanical, with a high-pressure pump which streams fuel continuously to the injectors; it does not have a computer, just a few relays to handle the cold start sequence etc. The chassis was also based on the 308 GT4, but with a 100-millimetre-longer (3.9 in) wheelbase at 2,650 mm (104.3 in). The suspension was the classic layout of unequal-length double wishbones and Koni dampers all around. Click each image for the larger photo.